Sherlock has Moriarty. Superman has Lex Luthor. The Road Runner has Wile E. Coyote. And the Doctor has the Master. Every great hero has his arch rival who serves as his equal and opposite. The one with whom he or she is evenly matched—dark to light, good to evil. It’s the person who drives the hero to greater heights, the one who ensures that the hero never slacks, never lets down his or her guard. In 1971, the Doctor Who bosses realized that while the Doctor had Daleks, Cybermen, Ice Warriors, Yeti and other recurring threats, what he needed was a single figure to challenge him at every turn, someone who could match the Doctor scientifically and intellectually. In other words, he needed a nemesis. And thus was the Master born. The Master is a Time Lord. In fact, he and the Doctor grew up together, attended the Academy together, and used to be friends. But their paths diverged, the Master craving power and control, and the Doctor pledging to stop him from causing harm to others as well as to established history. Being a Time Lord, he can regenerate like the Doctor can, and thus has been played by numerous actors over the past few decades. Unlike the Doctor, he has had both male and female personas. 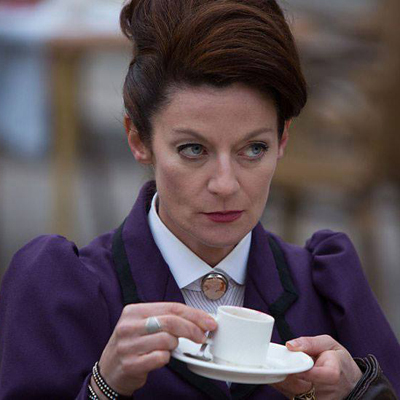 The most recent incarnation of the Master, played with panache and sass by Michelle Gomez, refers to herself as the Mistress, or “Missy” for short. She has been a regular thorn in the Twelfth Doctor’s side since his first season. She has had a recurrent presence in the story arc that has run through the 2017 season, in which Missy has been condemned to death and the Doctor (Peter Capaldi) has pledged to guard her body, locked away in a vault, for 1,000 years. Missy isn’t dead, though. As she told the Doctor’s previous companion Clara, “Death is for other people, dear.” Not only is Missy not dead, but it seems that she’s undergoing a change of hearts (Time Lords have two of them, you know)—she seems to be renouncing her evil ways and adopting the good. But is it genuine? Or is she luring the Doctor into a trap? The answers will come this weekend as Series Ten airs its finale, “The Doctor Falls.” But it’s not just Missy that the Doctor has to worry about, or even an army of Cybermen (check out part one of this article), but for the first time in Doctor Who’s history, we have a teaming up of two incarnations of the Master: Michelle Gomez’s Missy and the previous iteration played by John Simm from 2007-2010 (but here with a decidedly classic look about him, with his mustache, goatee and high-collared black jacket). There have been occasions on which multiple Doctors have worked together—usually coinciding with some notable anniversary for the show—but this is the first time that multiple Masters have met on screen. To get you prepared for this week’s finale, here are the five essential Master stories that will introduce you to (most of) his/her past incarnations and give you a sense of who the Master really is. The Master made his debut in “Terror of the Autons,” the first story from Season Eight, also the introduction of the Doctor’s new companion, Jo Grant. He remained a prominent figure throughout that season, appearing in all five stories across 25 episodes. Played by Roger Delgado, this Master was a dark, swarthy character with a penchant for elaborate disguises and a love of good cigars. The quintessential villain, the “evil mustache and goatee” look suited him impeccably. Though a thoroughly despicable character, Delgado’s Master was not without humor, élan and occasionally warmth. Subsequent stories clearly show a mutual respect and even a long-buried affection between the Doctor and his wayward chum, especially in the following season’s “The Sea Devils.” In “The Dæmons,” the Master, disguised as a village vicar, attempts to awaken the demonic forces of Azal, a cloven-hoofed beast that resembles images of the Devil. The Doctor (Jon Pertwee) and UNIT battle gargoyles, a heat forcefield, and inexplicable happenings to thwart the Master’s plans (and be on the lookout for a UNIT sergeant named Osgood!). The story offers good discussions of the “magic vs science” variety in a script that relies heavily on witchcraft, incantations and iconography. In the end, it’s Jo’s self-sacrifice to save the Doctor that destroys Azal. “The Dæmons” shows the Master at his devious, conniving best. Delgado and Pertwee, over the course of three seasons, add a great deal of dimension to the relationship between their characters. Over the decades, the Master has remained one of the key figures in the series’ mythology, and while there’ve been some great actors playing him/her, the on-screen dynamic between Pertwee and Delgado has rarely been bettered and the depiction of the “my enemy was once my friend” scenario was largely forgotten about until the Master’s rebirth in the modern series. 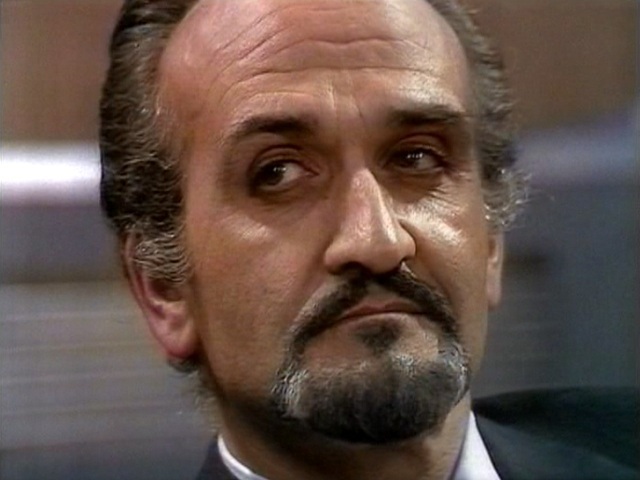 Roger Delgado played the Master for three seasons and had asked to written out the following year, as he’d lost other opportunities of acting jobs because of his work on Doctor Who. However, in the summer of 1973 during the break between seasons, Delgado was killed in a car accident in Turkey. The Master lay dormant for the next few years until Season Fourteen in 1976 when Peter Pratt took over as a very different kind of Master. 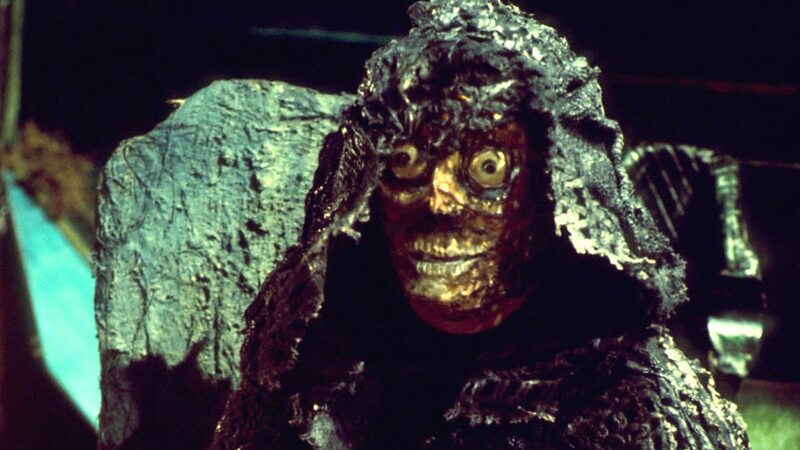 “The Deadly Assassin” is an extremely important story in the history of Doctor Who for a number of reasons. Mainly, it introduced many of the aspects of Time Lord society that we now take as writ, including the Matrix—the repository of all Time Lord knowledge and experience. Additionally, it establishes that Time Lords can only regenerate twelve times for a total of thirteen lives. Pratt plays a Master that we learn has gone beyond his natural life span and is basically refusing to die. He has, by the sheer force of his will, continued to exist without regenerating as a rotting, decrepit walking corpse. He’s desperate to escape death and regain his ability to regenerate and will destroy Gallifrey if necessary to do so. To achieve this, he lures the Doctor (Tom Baker) into a trap—he stages the assassination of the Lord President of Gallifrey and frames the Doctor for it. The Doctor is caught, swiftly put on trial and is about to be executed . . . until he escapes his fate by declaring his candidacy for President! “The Deadly Assassin” is a political thriller of the first order. The mental battle waged between the Doctor and the Master inside the surreal landscape of the Matrix is gripping and unlike anything the series had ever done before. The Doctor defeats the Master (spoiler!) but doesn’t destroy him, and the decaying Master makes one further appearance in Tom Baker’s final season. 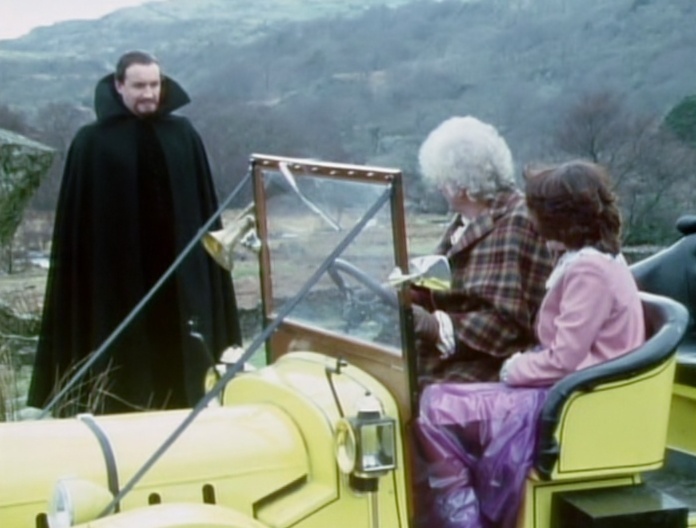 Doctor Who was canceled in 1989; the Master appeared in the final story, ironically entitled “Survival” (check it out, it’s one of Ainley’s best peformances). When an attempt at a revival was made in 1996, with a made-for-television movie co-produced by American network Fox starring Paul McGann as the Doctor, the Master was right there by his side (played at turns sinister and flamboyant by Eric Roberts). So when Doctor Who finally did return to television as a proper BBC series in 2005, an obvious fan question was “What about the Master?” The premise of the new series was that the Doctor was the last of his kind, the result of the Great Time War. No more Gallifrey, no more Time Lords. So obviously that meant, by default, no more Master, right? Hardly! The Master made his reappearance at the end of Series Three. “Utopia” is one of the really great episodes of modern Doctor Who, highlighted by the appearance of Sir Derek Jacobi playing Professor Yana, a pleasant, caring and well-meaning scientist who of course turns out to be the Master. Only he doesn’t know it—he has no memory of being anything other than Yana. But when his memories start to reawaken, and realization of who he truly is reemerges, Yana’s personality begins to change. Jacobi gives a stunning performance as a man tormented by these new thoughts of evil, but eventually surrendering to and embracing his true nature. The five or so minutes that Jacobi plays the fully awakened Master is incredibly powerful and a bit terrifying. When Jacobi first declares, in this repellent, sinister whisper, “I … am … the MASTER”, it’s one of the most riveting moments in Doctor Who history. But at the end of the episode he regenerates into his next incarnation (the first time we’ve seen a Master regeneration), played by John Simm. Simm’s approach is very different, playing an over-the-top, manic, whirling dervish of a Master. It’s like the Master on speed, but just as deadly and menacing as before. And the back story is changed, too. We learn from the Doctor Tenth (David Tennant) that as children, Gallifreyans are taken to the Untempered Schism (a rift in the fabric of time) and made to face the time vortex in its raw state. That moment is one of the defining moments of each child’s life. Most come away unharmed, but one little boy was driven mad by it. From that point on, the Master has heard a drumbeat in his head, driving him and tormenting him. While definitely a more frenzied take on the character, the Master was once again well-matched to the Doctor, now played by the rather hyper David Tennant. At the end of the story, the Master is gravely injured, and the Doctor urges him to regenerate, reminding him of all the things they’d done together. The Master refuses, though, and dies. The Doctor mourns the loss of his seemingly irredeemable ex-friend and the death of the last living member of his own race. But surely the Master couldn’t die that easily. . . In 2014, Oscar winner Peter Capaldi assumed the mantle of the Twelfth Doctor. After having not appeared during the Eleventh Doctor’s era, it was time to reintroduce the Master once again, but this time with a twist. 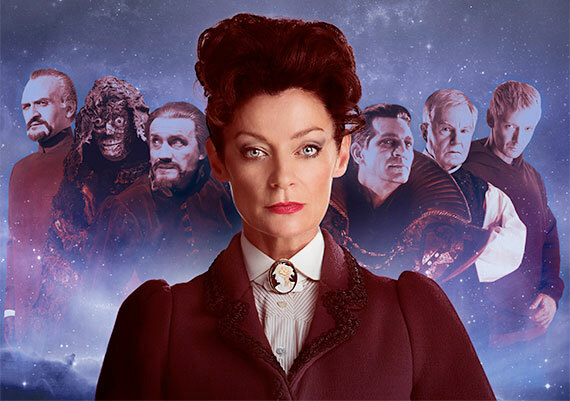 Now played by Michelle Gomez, the Mistress was teased throughout Series Eight with enigmatic little cameos until her full reveal in the final two episodes of the season, in which she has struck up an alliance with Cybermen (hmm, another foreshadowing of the Series Ten finale, perhaps?). The story ends with Missy admitting that the whole reason for the crazy scheme was so that she could be reunited with the Doctor—“I need you to know we’re not so different. I need my friend back.”—and we’re suddenly brought full circle back to the Pertwee/Delgado relationship. The following season kicked off with a fast-paced two-parter involving the Daleks and their creator, Davros. The Doctor has gone missing and seems to be preparing himself for death: his last will and testament has been delivered to his closest friend—Missy. She explains to the Doctor’s companion, Clara, that theirs is “a friendship older than your civilization, and infinitely more complex,” which very definitely sounds like a summation of the Pertwee/Delgado relationship just as much as it does the Capaldi/Gomez one. Gomez’s take on the Master/Mistress is a very interesting one. At the WHOlanta convention in Atlanta, GA in 2015, she revealed that she grew up watching Delgado’s Master on screen. At the same convention, Katy Manning, who played Jo Grant, said that she could see Delgado in Gomez’s performance. And yet she also has the element of dangerous insanity from Simm’s Master as well as the pompousness of Ainley’s and even a bit of the flair of Roberts’. Like Delgado, she is well paired with her Doctor. In “The Magician’s Apprentice/The Witch’s Familiar,” she exudes a confidence about who she is and what she wants, and she takes any actions necessary to achieve them, whether it be pushing Clara down a pit, enslaving her within a Dalek casing, offering to help the Daleks steal the Doctor’s TARDIS, or killing a UNIT operative just to illustrate to Clara that she’s not “turning good.” But in the current season, she seems to be adopting a new morality. Has she genuinely changed her ways? And if she has, will re-meeting her former self (John Simm) sway her? Or is she laying a fiendish trap for the Doctor, playing on his hopeful nature? The finale of Series Ten of Doctor Who airs on BBC America Saturday, July 1 at 9:00 p.m. It stars Peter Capaldi as the Doctor, Pearl Mackie as Bill Potts and Matt Lucas as Nardole. It features Michelle Gomez as the Mistress, John Simm as the Master, as well as the 1966, 2006 and 2013 iterations of the Cybermen.